PRESS RELEASE: AmpKit 1.1 is a massive update to the powerful and highly acclaimed AmpKit guitar amps and effects app. The update features a beautiful iPad interface, audio copy and paste, setup sharing, iPod music library access, exciting new gear, and much more. AmpKit and its companion AmpKit LiNK, a high fidelity electric guitar adapter, provide guitar and bass players with the highest quality amps and effects simulations across the full range of iOS devices. Agile Partners and Peavey Electronics announced that AmpKit Version 1.1, a major update to the powerful and convenient guitar amps and effects app, is available for download on the iTunes App Store. AmpKit is available in two versions: AmpKit and AmpKit+. The apps and their companion AmpKit LiNK, a high fidelity electric guitar adapter, provide guitar and bass players with a powerful way to play, practice and record high quality tones anytime and anywhere. AmpKit is part of Agile Partners' highly acclaimed suite of guitar apps that also includes App Store Hall of Fame inductee, GuitarToolkit; 2010 Apple Design Award winner, TabToolkit; and recent iPad and iPhone App of the Week, Guitar World Lick of the Day. Now a "universal" app supporting iPad, iPhone and iPod touch, AmpKit 1.1 is available for free to everyone who already purchased AmpKit or AmpKit+ for iPhone/iPod touch. In addition, any gear (i.e., amps, pedals, mics) that users already purchased can be easily shared across devices using AmpKit's Restore Purchases functionality. With AmpKit, users never pay twice for the same gear, even if they have both iPhone/iPod touch and iPad devices. AmpKit 1.1 leverages the iPad's seamless rotation between landscape and portrait orientations and takes full advantage of the iPad's larger display. For example, you can view an entire amp and pedals setup while simultaneously modifying gear settings, or view as many as 15 setups or presets at once without scrolling. AmpKit 1.1 provides users with a delightful interactive experience that includes beautiful amp and pedal artwork designed specifically for iPad. "This is a huge update to AmpKit," commented Jack Ivers, a principal at Agile Partners. "AmpKit 1.1 raises the bar in a serious way with a beautiful iPad interface and a ton of new features for all iOS users: post-amp effects which bumps up audio quality significantly, audio copy and paste which connects AmpKit with dozens of excellent iOS apps, setup sharing, direct access to music from your iPod library, and more. Finally, AmpKit 1.1 demonstrates our commitment to expanding AmpKit's gear offerings, with three superbly executed new components: the American Acoustic amp and the Tremo-LOL and Wahba Doo pedals." Audio Copy & Paste: One of the major new features in AmpKit 1.1 is audio copy and paste. AmpKit users can now copy AmpKit recordings and paste them into other apps such as Sonoma's FourTrack and StudioTrack apps or Harmonicdog's MultiTrack DAW. You can also paste audio from other apps into AmpKit as either backing tracks or dry guitar audio. AmpKit supports both Sonoma's AudioCopy/AudioPaste standard and Apple's General Pasteboard, for maximum compatibility with other iOS audio apps. American Acoustic: Specifically designed for the electro-acoustic guitarist, this new amp has 16 built-in acoustic-friendly effects and an ultra-crisp PA simulation cabinet. Tremo-LOL: A great new Tremolo pedal with American and British tremolo modes in a single unit -- an incredible value. The Effector Pack: 6 great stomp-boxes including delay, reverb, octave, tremolo, vibrato, and wah. The Power Pack: Six amps with a penchant for gain, plus eight additional gain and compression effect pedals. Post-Amp Effects: You can now place pedals both before and after the amp in the effects chain, enabling major improvements in audio quality and many effects, including reverb and delay. Instant Access to iPod Music Library: No lengthy process here - just select a song from your iPod library and jam along instantly. Setup Sharing, Favorites and Locking: You can now email your setups and presets, "star" your favorites, and lock setups to prevent accidental modification. QuickJump: Jump easily from one favorite setup or preset to another without leaving your gear display. Recording Enhancements: AmpKit now provides an enhanced composite waveform that shows both wet and dry levels on the same display, and you can flick-scroll recordings. Rotation Support for iPhone/iPod touch: You can now use AmpKit with your iPhone or iPod touch inverted which enables better cable routing in many instances. AmpKit and AmpKit LiNK launched in August 2010 to rave reviews from not only the music and technology press, but also artists. Joel Kosche of Collective Soul said, "This thing is awesome! No more dragging around a bunch of different boxes and gadgets from hotel to hotel just to get a little practice in or record an idea for a song" and Jeff Klein of My Jerusalem commented, "Using AmpKit is like having a practice amp in your pocket at all times. I've already written two songs using it in hotel rooms." 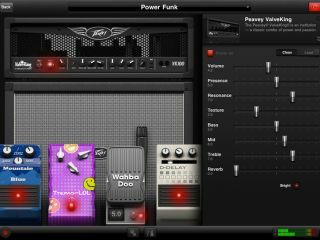 AmpKit is a free app that includes the Peavey ValveKing amp, two ValveKing cabinets, two pedals, two mics and a variety of built-in features including recording, re-amping, backing tracks, tuner and metronome. AmpKit+ is a paid app ($19.99 in the US App Store) that bundles three additional amps, four more cabinets, eight additional pedals, and six more mics, at less than half their individual prices. Both versions of AmpKit include an in-app Gear Store where additional gear can be purchased either a la carte or as part of significantly discounted bundles. For more information, visit http://ampkitapp.com and http://peavey.com/ampkitlink.